Guymon Firefighters were called to a reported structure fire, but when they arrived to the scene the situation was much different than expected. The 911 call came in at 12:30am Sunday morning reporting a structure fire at 514 SE. 1st street. “These are duplex apartments in the alley between East and South May”, said Assistant Fire Chief Grant Wadley. When first responding units arrived on the scene, they reported an entire duplex residence destroyed with little fire showing. “The structure was destroyed by what Firefighters believed to have been an explosion”, Wadley stated. Immediately, Firefighters and Police cleared the area and the remaining duplex buildings as temporary safety measure. There was no entry by Firefighters to the affected duplex as it was destroyed and lying in pieces. Only one side of the duplex was being rented at the time and that occupant was located several houses down visiting friends at the time. There was a small fire found inside the debris and was quickly extinguished by Guymon Firefighters. “Witnesses near the duplex stated they heard a loud explosion at the same time seeing the entire structure lift up in the air and come straight down collapsing upon itself”, said Wadley. 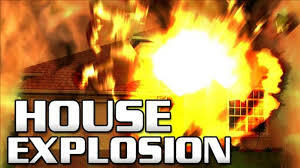 Other homeowners nearby stated of hearing and feeling the explosion that rattled their windows. Structural damage also occurred to the duplex apartments on both sides of the one that was destroyed. All utilities to this duplex apartment were shut off immediately. It is suspected this was caused by a gas leak inside the structure, but the investigation is still on going at the time of this report. No injuries were reported and those that were cleared out early were able to go back to their homes shortly after the area was deemed safe. The Guymon Police Department, Texas County Sheriff Office, Oklahoma Highway Patrol, Guymon Utilities Authority, and Tri-County Electric assisted Guymon Firefighters.